The Dillon Wins Parade of Homes Awards! Home » Design » The Dillon Wins Parade of Homes Awards! August 30, 2018 – The 2018 Parade of Homes is now a memory but Jayden Homes is celebrating the success of The Dillon, the newest addition to our popular Lake Collection. Featured in Forest Lakes in Monument, The Dillon, a ranch style home with four bedrooms and approximately 3,200 square feet, is proving to be popular with parade visitors and the home building industry as the home received the coveted People’s Choice (for its price category) and three Industry of Excellence Awards for Best Kitchen, Best Architectural Exterior, and Best Overall Home. Designed by Jayden Homes and merchandised by Spectrum Design Studio, The Dillon was expertly situated to maximize the views and terrain of its Forest Lakes homesite. 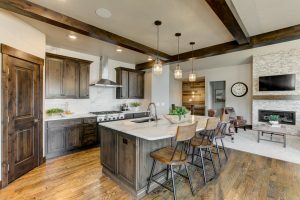 An energy efficient, custom home, The Dillon showcases the best of Colorado living with a focus on an active, casual lifestyle and exquisite Colorado outdoor living. Click here to learn more about the 2018 Parade of Homes. About Jayden Homes: Celebrating over three decades in Colorado Springs, second-generation Jayden Homes, builds award-winning homes (and award-winning relationships) in El Paso, Elbert, and Douglas counties. A quality conscious custom homebuilder with an emphasis on establishing a close working partnership with our clients, Jayden Homes is dedicated to providing an extraordinary home building experience with a well thought-out process that allows for less waste and a more efficient method to the construction of your custom home.